My name is Krys and I’ve been working with Dr. Andrew since August 2014. I’m very much a people person. I love being able to help people feel better about their smiles and themselves! I love that I’m able to help educate patients about their oral health and how it affects their over all health. I also enjoy working with kids and making them feel comfortable so they don’t grow up being afraid of the dentist. When I’m not working, I love spending time with family and friends and cooking for them. I also enjoy sports, camping, working out, shopping, traveling and, most of all, playing and crafting with my two kids! My name is Vicki and I’ve been Dr. Greg’s assistant since 2009. I really enjoy getting to know our patients and helping them with all of their dental needs. Outside of the office, I like to spend time with friends, read a book and watch a good movie. 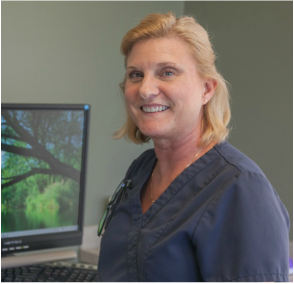 My name is Dawn and I've been working with Dr. Boyer since 2006. My favorite part of my job is getting to know our patients. In some aspects, we are like family. I love helping people improve their smiles, which helps their overall self confidence. When I'm not at the office, I love playing with my dogs! I also enjoy traveling and boating. My name is Beth and I've been working with Dr. Boyer since 2012. I look forward to getting to know our patients and helping them have the best dental experience. After almost 20 years in the dental profession, I'm always curious about new dental technologies and ideas that can help patients be as healthy possible.